For the first time this season, all 22 of Drum Corps International's World Class ensembles came together to compete at the same event when Marching Music's Major League took over the Alamodome on Saturday, July 19. 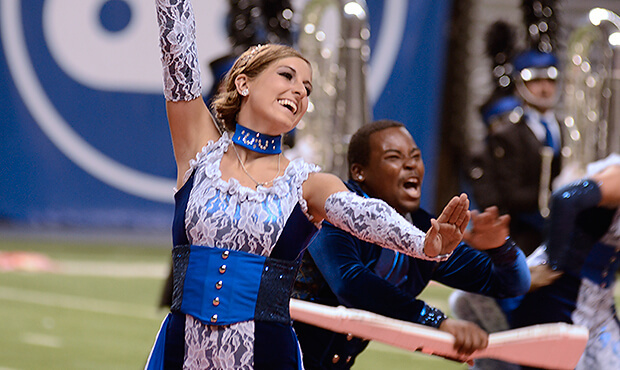 As 11,620 spectators watched on, the Blue Devils emerged victorious, taking home first place with a score 91.650. Like all of the corps who performed on Saturday, this was the Blue Devils' first indoor performance of the season. And according to drum major Kristen Lichtenthal, that posed some challenges. "It's unlike anything else. The soundscapes are ridiculous and the listening environments can be horrifying, but the staff prepared us very well," Lichtenthal said about the Alamodome. "The corps was hyper aware and they held it together rather nicely." The Cadets followed in second place with a score of 90.975 and the Bluecoats' "tilted" performance earned them third place with a score of 89.850. 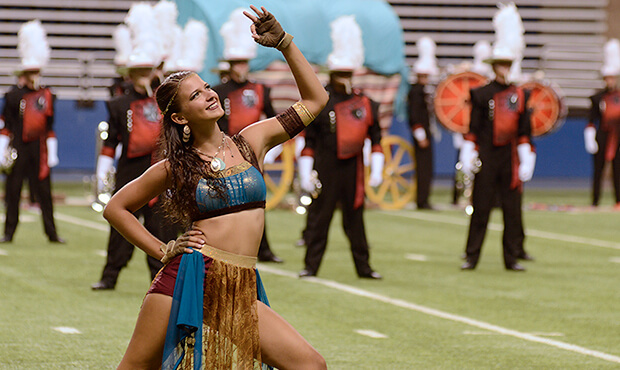 When Santa Clara Vanguard members took the field to perform their 2014 program "Scheherazade: Words 2 Live By," the crowd was in for a special treat. The corps recently added a tag ending, so this was one of the first audiences to see it live. "I think the music is absolutely gorgeous," said drum major Noe Gomez about the new ending. "It's personally my favorite part. We performed it for the first time in Denton, so it's still very new to the audience and to the corps." Vanguard took home first in percussion (18.2) and fourth place overall (89.000) narrowly edging Carolina Crown (5th, 88.700) for the first time since July of 2009. The Cavaliers (6th, 86.925), Phantom Regiment (7th, 84.725), Blue Knights (8th, 84.100), and Boston Crusaders (9th, 82.425) rounded out the last of the single-digit placements. Two of Wisconsin's corps finished back to back, with less than half a point separating them. 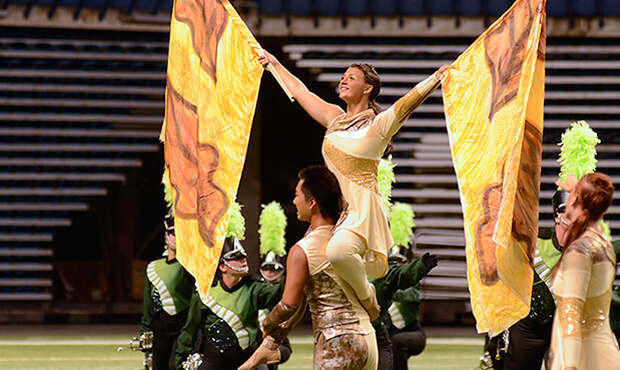 Blue Stars scored 81.725 and received 10th place while the Madison Scouts took home 11th with a score of 81.425. This was the first time in 2014 that Blue Stars have outscored the Scouts. Crossmen drum major Jordan Schock enjoyed the opportunity to perform for a strong alumni base in the corps' hometown of San Antonio. The home team scored a 80.250 putting them in 12th place. "It feels amazing to be performing in front of this crowd, and it's always nice to be home," said Shock. "From here we are just looking forward. It's going to be a quick three weeks, but we're going to have a blast." Troopers (13th, 77.900), Spirit of Atlanta (14th, 76.550), Colts (15th, 76.100), Oregon Crusaders (16th, 74.800) all had strong performances in San Antonio, looking for an edge that will help vault them into the top 12 corps that earn spots at the DCI World Championship Finals this August. After a sophisticated performance of "Vanity Fair", the Academy found themselves in 17th place with a score of 74.775, and according to drum major Kyle Edwards, a fifth-year veteran, the corps has made great progress since the beginning of the season. "This is a really young drum corps, and although they started out a little unsure, I have seen them really come together and click within the last couple weeks," said Edwards. "The progress is visible, and as I'm standing on the podium I can see that everyone's having fun and working hard." Pacific Crest members delivered a whimsical performance of their 2014 program, "No Strings Attached," that earned them 18th place and a score of 73.050. Led by the corps' drum major who conducts as a human marionette, the corps frolicked across the field like puppets all the way up until the closing notes of a high energy can-can. Mandarins (19th, 72.375), Jersey Surf (20th, 69.650), Cascades (21st, 67.200) and Pioneer (22nd, 64.125) rounded out the World Class competition for the night. In the Open Class division, Genesis from Austin, Texas, came in first place with a score of 65.500. 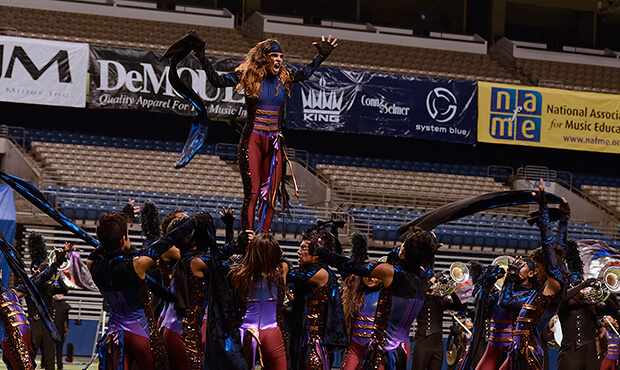 The Guardians, another Open Class ensemble from the Lone Star State, took second with a score of 61.275. 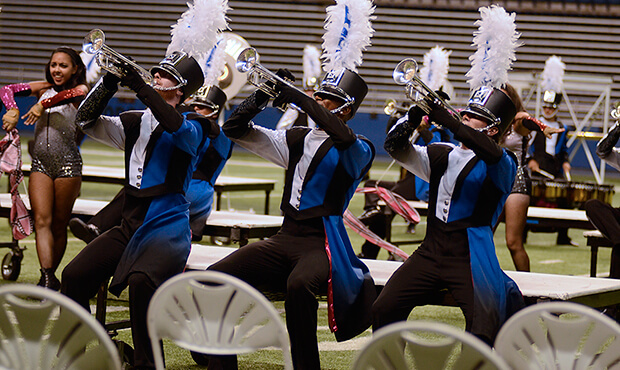 In 2013, the Guardians performed in exhibition at the DCI Southwestern Championship as a SoundSport team. After joining DCI's Open Class division this summer, Saturday marked the Seguin, Texas corps' final performance of its inaugural season. For corps director Johnathon Doerr, it was an emotional one. "This has been a season of growth," said Doerr. "Last year we came here with 50 people, and this year we came back with 110. We're moving in the right direction, and I believe next season will be even better because of what we've accomplished this year." These 22 World Class corps will continue their trek this coming week through the southern United States, making stops in Texas, Louisiana, Oklahoma, Mississippi, Arkansas, Alabama and Tennessee before meeting up for another regional event in Atlanta on July 26.